A body found at an RSPB nature reserve is believed to be that of a 54-year-old woman who went missing from a Norfolk beach. A body of a female was found on a beach at Minsmere Nature Reserve in Suffolk on Tuesday. While police said formal identification of the woman’s body is due to take place, it is believed to be that of 54-year-old Carol Smalley, from Lincolnshire. Police said the death is not being treated as suspicious and a file for the coroner will now be prepared. Mrs Smalley was last seen on Wednesday, January 3 with her clothes and a bag found on a beach at Hopton. Her disappearance had led to extensive searches with police even using a drone. Previous searches involved lifeboat crews and Coastguard teams, a Lowland Search and Rescue Team and the Norfolk Fire and Rescue Service. In 2017, Fort Collins police launched drones to investigate serious and fatal crashes for the first time. The program’s first flight was in August, and police used the technology seven times during the course of crash investigations last year. The drones help police snap photos faster and open roads sooner, according to members of Fort Collins police CRASH team, which responds to serious crashes. In the past, police had to close the affected road or intersection, use small yellow tents to mark evidence and collect measurements between the markers. They might place anywhere from 40 to 150 evidence tents. That painstaking process took hours — sometimes more than six — during which frustrated motorists couldn’t drive through the area. With the use of drones, police continue to mark evidence with tents but can expedite the process by snapping overhead photos and then calculating measurements after the scene has reopened. Police will still spend several hours on scene examining evidence and taking close-up photographs, but the drone can help shave several hours off the process. “At the scene, all we’re really doing with the drone is taking pictures. We can take those pictures and bring them back,” said officer Drew Jurkofsky, a CRASH team member trained in scene reconstruction. Police also said they close roads or intersections in serious cases but try to limit the closure. Police emphasize that closing a road protects officers on scene and protects evidence that would otherwise be lost under the tires of passing cars. Drones won’t replace the rest of the investigative techniques police use, though. “It’s not the end-all be-all,” said officer Tim Brennan, another member of the CRASH team. “There are limitations where you can fly” — such as in areas with dense foliage or power lines, and when the weather is bad. They also take more time when light is low and at night. 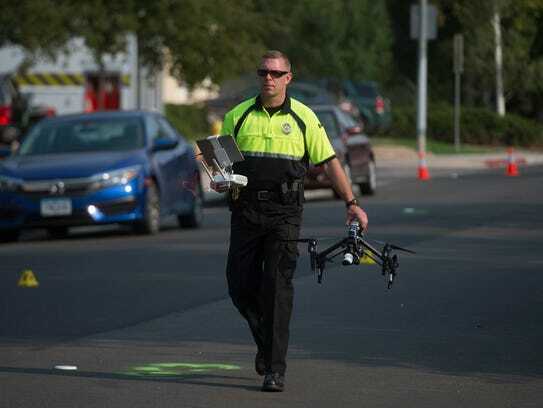 That being said, Fort Collins police anticipate that other agencies in the county will begin using drones more regularly in their own crash investigations because they act as a helpful tool in collecting more evidence. Fort Collins Police Services, the Larimer County Sheriff’s Office, Loveland and Colorado State University police departments, Poudre Fire Authority, and Loveland Fire Rescue Authority collectively launched a regional unmanned aerial system program in late June 2017 to assist in investigations, including serious crashes and backcountry search and rescue operations. The six participating agencies have a total of five drones, and each agency has a group of FAA-certified pilots. They’ve outlined polices, procedures, and privacy and safety information on larimeruas.com. ST HELENS, Ore. — As he prepares to launch the mini 4 rotor helicopter in the parking lot of his St. Helens office, Oregon State Police trooper William Bush is very formal, following all the rules. “We’re not pilots that are out there flying around casually,” he said. There’s a pre-flight check, ground rules for operation, and information, mainly still pictures, that are is recorded with the help of different software. One thing you don’t do here is call this piece of technology a “drone.” It’s an sUAS – small Unmanned Aircraft System. Bush has been authorized to test the sUAS. He’s a member of OSP’s Collision Reconstruction Unit. Until recently, the team has employed everything from simple technology like a tape measure, to photos and video, and a GPS-based surveying device to record data at crash scenes. 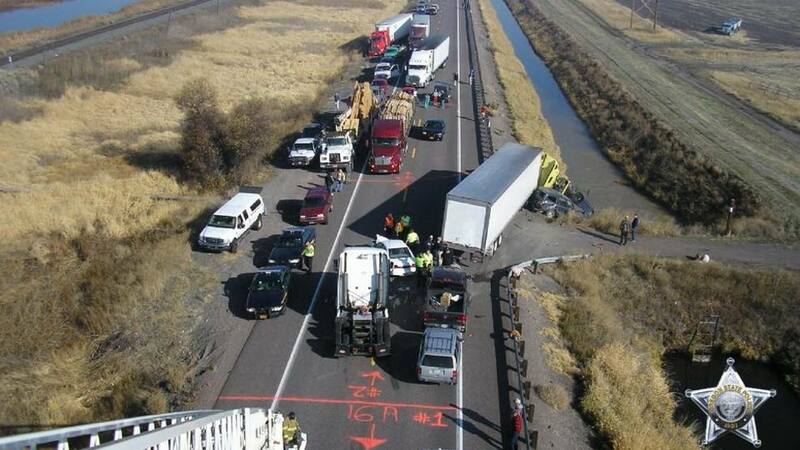 It’s a process that can take anywhere from 45 minutes to several hours depending on how serious the crash is. They have to take time recording information because distance calculations matter in their work. The sUAS flies along a planned out path scanning and capturing the photos which can eventually be rendered into a top down view or 3-D image of the scene. The technology has opened some new doors for investigators. “We have a readout of everything that’s going on,” said Bush. The FAA and Oregon state statutes mandate the sUAS can only climb to 300 feet. Troopers have a five-day window once an investigation starts to fly the helicopter. “Obviously people don’t want law enforcement in particular up in the air always looking, that’s not our purpose at all,” he said. Troopers are working to expedite the investigation process. The testing is being supported by a small grant, but the technology and associated software are changing too rapidly for OSP to make a full investment right now. “It’s expanded use, we’re going to be taking those incremental steps, because we don’t want to make an investment that’s irresponsible with taxpayer money,” he said. But the future is bright for this technology, and Bush believes the possibilities of its use are far-reaching. “Watching it develop over the course of the next five years, I’m in a fortunate position to be able to be a part of it,” he said. From the green hills of Northern Ireland to the sunny shores of Trinidad, police drones are on patrol – saving lives, pursuing bad guys and protecting borders. Last week, the Estonian Police and Border Guard Board demonstrated nine recently purchased ELIX-XL quadcopters from Estonian drone company ELI Airborne Solutions deployed to protect the Baltic nation’s eastern border. The $600,000 drone squadron will also be used for search and rescue. “The use of drones in the everyday work of the border guard creates even better possibilities for preventing, detecting and stopping border incidents,” Estonian Interior Ministry official Raivo Kuut told the media. “Whether it is an illegal border crossing, a rescue incident on a border body of water or a landscape search — the information gathered with the help of a done gives border guards additional possibilities for planning and executing their activities,” added state police official Helen Neider-Veerme. The Police Service of Northern Ireland’s Air Support Unit is sweeping the area north of Belfast. The PSNI implemented the drone program in 2013, to protect a G8 summit in Belfast. The drone cop quickly earned its keep, providing the bomb squad with a bird’s-eye view of a small, unexploded explosive that was later defused. Last week, officers in Trinidad tracked down two suspects who reportedly fired shots before fleeing the scene in a stolen car. Using one of four year-old drones, police were able to gather real-time imagery of the car as it snaked through the streets of El Dorado. Thanks to the eye in the sky, police successfully detained two men, recovering a Lugar semi-automatic pistol and more than 180 grams of marijuana. “We want to use these drones to ensure that police carry out their duties within the legal framework that governs the [national police],” a police official said. The Isle of Man is looking for some unmanned police assistance via drone. Police are seeking a drone facility to “provide a 24-hour call-out to assist with road traffic collisions, area searches and crime scene investigations,” according to news reports. The program is part of an emerging tech strategy the constabulary announced two years ago and includes plans to add body cameras, license-plate recognition software and autonomous speed detectors. Officials say one third of the home is completely destroyed. Crews responded to a fire at an abandoned mansion,Saturday around 9 p.m.
Take a look at drone images from the blaze courtesy of Christian Viering. Several area departments responded to assist and we able to successful get the fire under control around midnight. It is unclear at this time what caused the estimated 10-12 thousand square foot home to catch fire. Take a look at the after images, courtesy of Christian Viering. Supporting crews were released around 2 a.m., while the Fairlawn Fire Department remained on the scene throughout the night, to manage hot spots. *All photography and videography courtesy of Christian Viering. Toledo Police tell 13abc that officers are still searching for 15-year-old Quamell Jones. Quamell was last seen on N. Holland Sylvania early Saturday morning. The teen has autism and police say he functions at an 8-year-old level. Wind chills overnight were below zero. Toledo Police said they have K-9s, marked units, and even a drone looking for the autistic teenager. Quamell is a black male and was last seen wearing a puffy style black coat, blue jeans, and brown shoes. He weighs 120 pounds and it 5’9″.